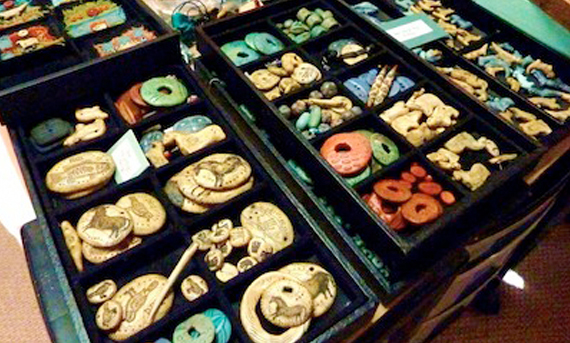 Beads are the heart of jewelry making and a supply that is easy to collect. 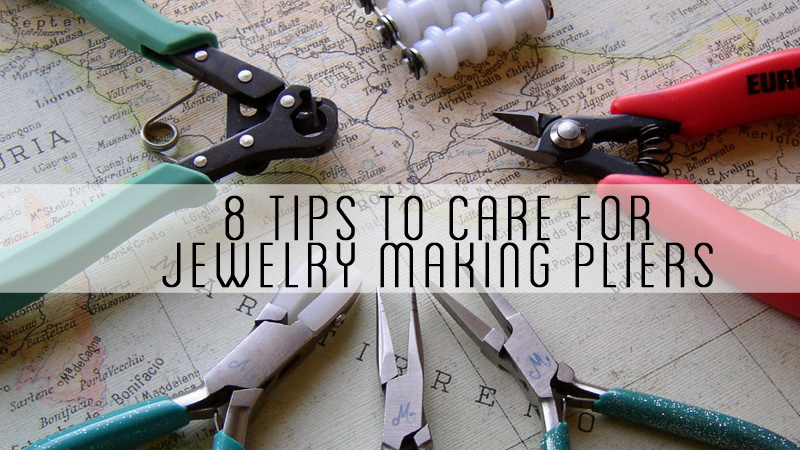 This is one craft supply that can quickly turn your craft room into disarray. 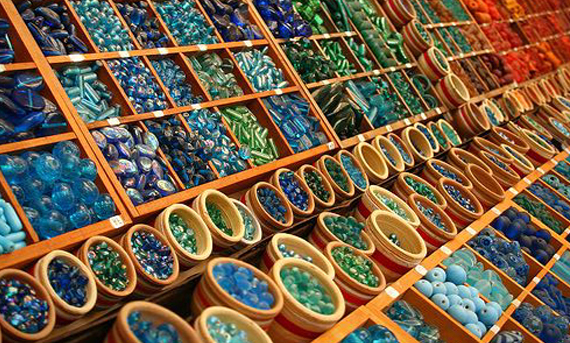 Finding the right bead storage solutions for your craft room will help you easily locate the right shapes and colors you want for your project. Here are ten creative examples of bead storage solutions you can integrate into any size craft room and offer a variety of ideas for easy retrieval. Using storage containers is a great way to quickly gather your beads together in a single location. Stack your containers on a bookshelf to maximize your storage potential. Perfect to transport or carry across your home, storage containers are one of the best options for many crafters and a versatile choice. For small items, place them together in smaller storage containers to easily locate. 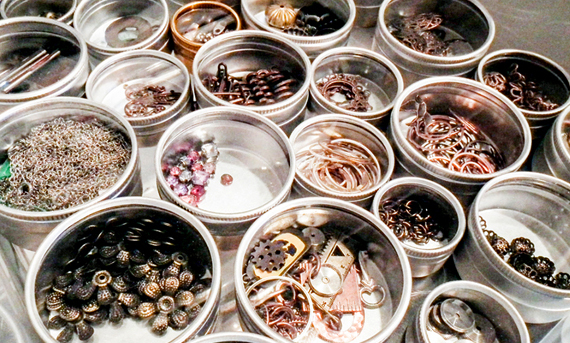 In this example, small round containers are a great option for findings, links, and bead caps. 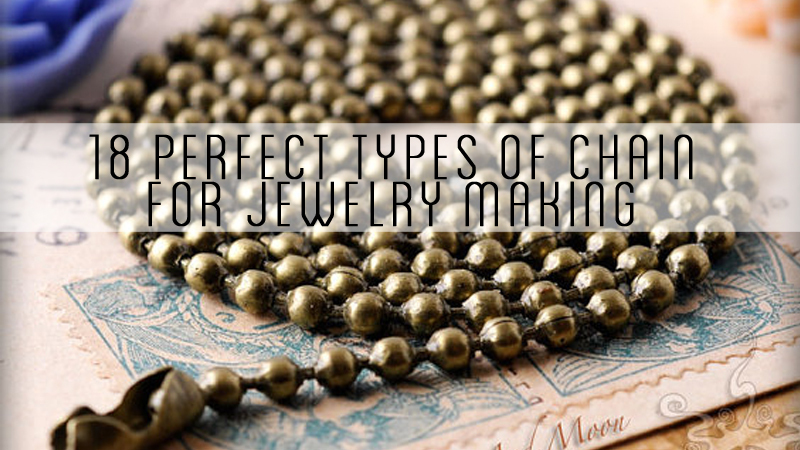 Charms of similar nature are another great example to a type of supply that can be grouped together. 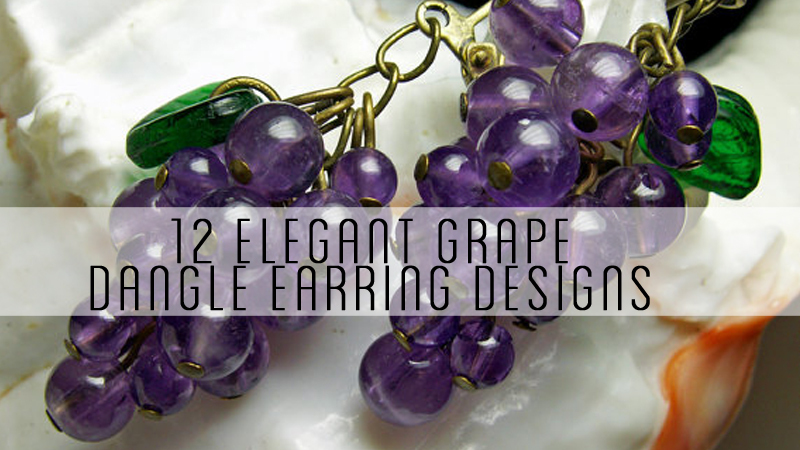 This will make it easier to view your collection of in its entirety when designing your pieces. Having the right type of storage solution for your tools is important for easy access or proper care. Keeping your pliers placed upright and separate from one another is a great way to keep them protected and in easy view. 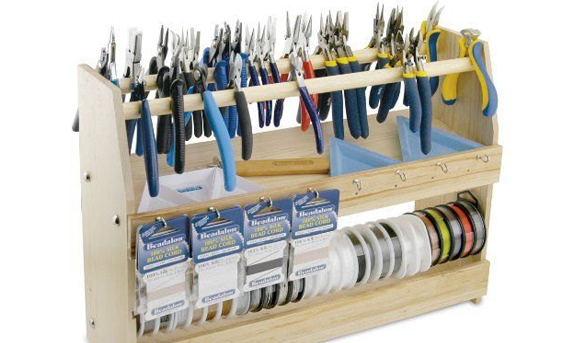 In this example, the pliers are placed together with other necessary supplies such as beading wire and bead trays. Click here to purchase this beading station. Stacking your storage upwards is a great way to maximize your space in smaller craft areas. One idea is to use compartmentalized storage where beads can be separated and stored for easy access. Specialized units can be purchased with pull out drawers or you can use other existing furniture with tray inserts. Pendants are a staple to many jewelry pieces. Use large trays to keep your main focal points stored in. This will make it easier for you to visualize your design and build the rest of your piece from. 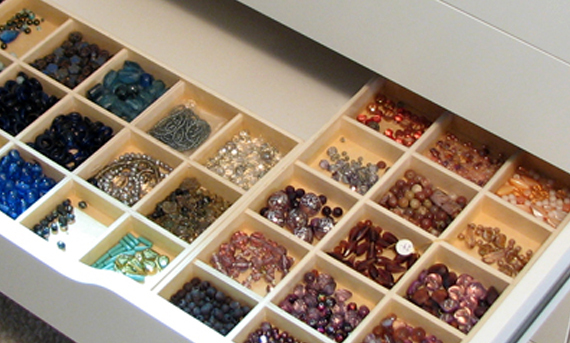 Large bead trays are easy to store, allowing you to stack each one on top of the other. 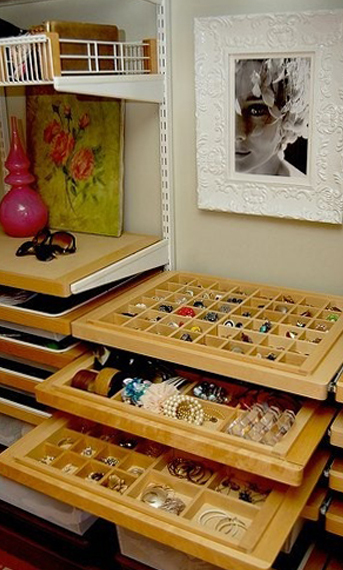 Make your craft storage fashionable with some pull out trays that keep your supplies accessible and easily viewable. Trays can be easily labeled and are a top choice for many crafters. 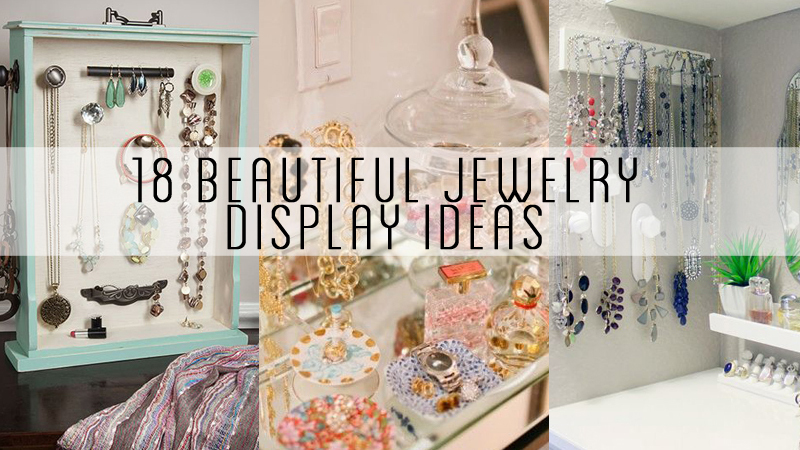 In the above example, these trays are used for jewelry storage, giving you another great idea for storing your completed pieces. 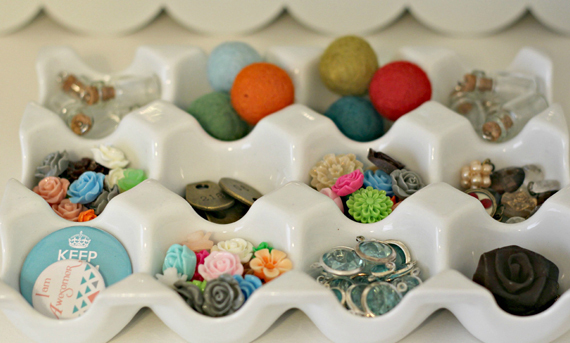 Grouping colors together is a great way to add some inspiration to your bead storage. 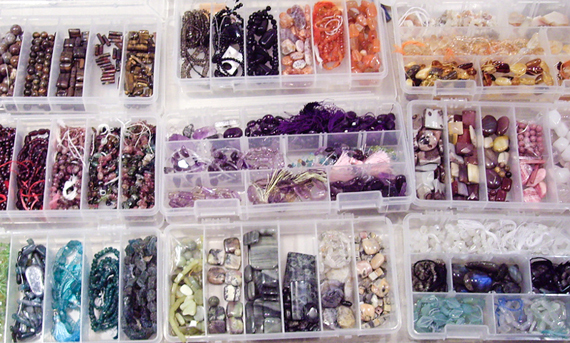 This style of organization offers you an easy way to identify the variety of bead cuts and sizes you have on hand. Using an open display can make your selection process easier when creating each piece. 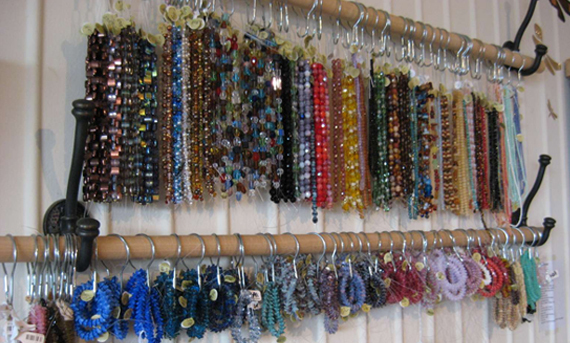 Hanging strands up is a great method used in bead stores to display their selection and can be equally effective in your home. Not all beads are purchased on strands. 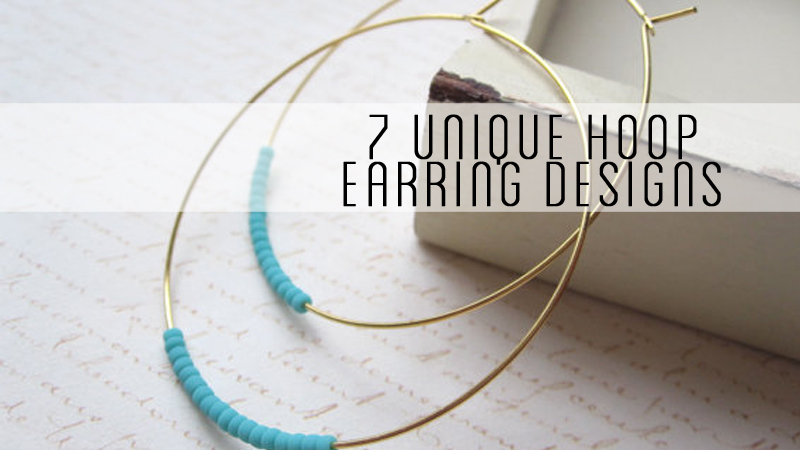 However, this does not have to stop you from taking some embroidery thread and stringing your beads together to display. Using some books and dowel rods or curtain rods, group your stands together and hang on clips. Egg cartons are a top choice for many crafters as a reusable storage solution. You can find a variety of other packaging types to upcycle and use as a form of inexpensive storage. From cardboard to glass jars and tubes, start gathering together old product packaging to find new uses. 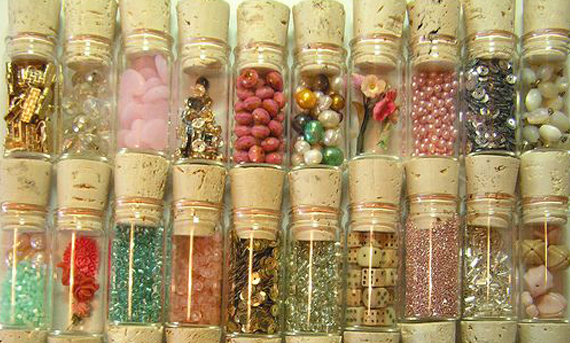 Small tubes are a great option for small items such as seed beads. Tubes are another great way to keep eyepins and headpins or other findings grouped together. You can easily set these on the shelf or group all of your tubes together and store in a small box or case.